I feel that in way too many cases where the founder and main songwriter in a band is also an outstanding solo artist, the main objective is showcasing just outstanding an artist this particular artist is. 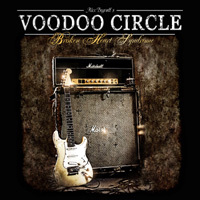 That is thankfully not the case with "Broken Heart Syndrome", the sophomore release from Alex Beyrodt's Voodoo Circle. Voodoo Circle has found a fine balance between straight forward bluesy hard rock songs and more powerful hard rock, always leaving enough room for Alex Beyroth to showcase his immense talent and the rest of the band to shine on their own; David Readman delivers a very good performance on vocals, the rhythm section is very tight, only the keyboards seem a bit lost sometimes. And even though the album is packed with great guitar runs and brilliant leads, the importance of a great melody and catchy hooks is never lost. "Broken Heart Syndrome" is a clear step forward and shows a mature band; this is teamwork and not guitar hero music.